Patio Coatings are both functional and decorative. They provide a surface that can be easily cleaned; they seal the concrete, minimize concrete dust and provide an upgraded look over the drab gray cement. 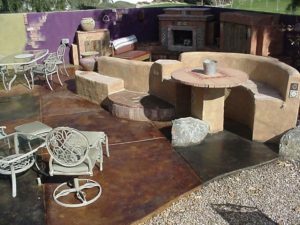 You can choose a great Southwestern look, our simulated flagstone coating, at a fraction of the cost of real stone. Our flagstone coating is so natural looking you won’t believe it is not real. Each of our stone and tile coatings are created just for you; customized to your home’s colors and surroundings. We offer a wide variety of custom colors and stone designs. Our flagstone patio coatings can be applied indoors or outdoors; in residential or commercial settings. Not the Southwest Flagstone Type? We offer many different coating systems. You can choose from an “Old World” look of Acid Stain or the look of Granite with our Vinyl Chip Flooring system. These color chips or flake blends are available in colors that will surely compliment your patio area. Best of all, all of our coatings offer a durable surface that requires minimal maintenance. Cleaning is easy with soap and water. What are you waiting for? Give us a call today and let us show you how we can transform your patio into a work of art! Has your swimming pool deck seen better days? Or, are you just tired of looking at that same old deck year after year? There are more choices available for pool deck renovation than you may be aware of. What is currently on your swimming pool deck? If it is bare concrete, you’ve got a clean slate and the “sky is the limit” on what can be done. Have one of the old “cool deck” coatings? You know, it looks like dimpled concrete deck. No matter what you currently have on your existing deck, Amazon Coatings will work with you on your new swimming pool deck design. Our Flagstone Coating offers a textured surface, giving you the look and feel of real flagstone and helps to minimize slips and falls. Colors and textures are determined prior to application to meet your specific needs. Not a fan of flagstone, how about our Stone Top or Tile Coating. Also textured coatings, they are available in many color choices and designs. Maybe your pool deck coating is ok, but you want a change. Why not just Re-Color? It’s a great cost effective option! Kool Deck® still good but looks bad? Why not a cost effective update. We can add a decorative border in either flagstone or tile and re-color the rest of the surface. Gives it a fresh new look to the area. Our pigmented acrylic coating covers and seals your deck to allow for easy clean-up and stain resistance. How about a matching flagstone coating on your patio to complete the transformation.